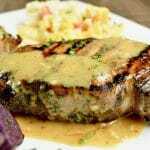 Juicy Grilled Honey Mustard Glazed Pork Chops: This recipe is the no fail way to make succulent, tender chops. Marinate for 30 minutes, grill and have them on the table in about 20 minutes. Todays Recipe for Juicy Grilled Honey Mustard Glazed Pork Chops came about after a conversation about how to grill boneless pork chops that weren’t dried out and tough. So many places that serve pork chops cook them until they are so dried out that they are tough and all the amazing juices are cooked right out of them. That in turn leads to pretty tasteless pork. Nothing beats the flavor of pork chops when they are cooked right. Each bite is tender and the meat remains really succulent throughout the entire chop. I love how the edges get a great sear on a hot grill and how it contrasts with the tender meat inside and the juices just flow in each bite. Pick the right cut of pork. Center Cut Chops and Rib Chops are the best. The meat on blade chops is close to really stringy muscles so when you’re eating it it can be difficult to chew. Its possible to get a tenderloin to not dry out, but it requires lots of attention while cooking. Use Meat that is about 1 1/2 inch thick. The meat is thick enough to get a good crust, but not so thin it dries it out. Brine the pork chops. This allows the chops to be more flavorful AND succulent. How to Grill Pork Chops? Turn on your gas grill, or get coals ready to heat for a two temperature cook area. On a gas grill, have one area on high, and one area on medium. With charcoal, know where the hot spots are and know where its a lot cooler. While the grill is heating up, pull out the pork chops and place on a plate, shaking off any additional marinade. 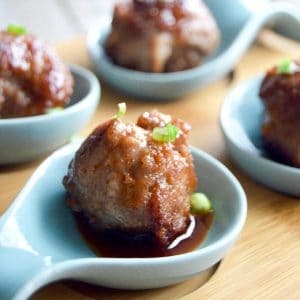 Place leftover sauce in a sauce pan and bring to boil for 5 minutes to cook any remaining pork juices. Set aside to serve over top of cooked pork chops. 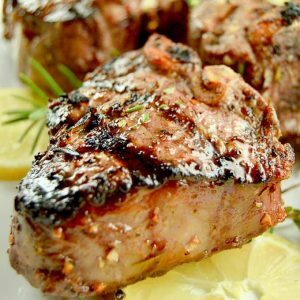 These chops are so simple, the marinade can be made the night before if you are short on time before entertaining. 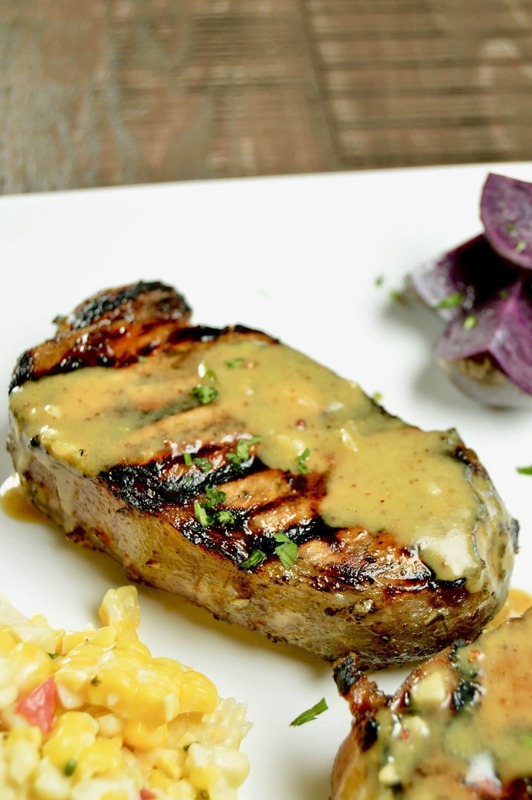 That being said, if someone shows up and you need to put together a delicious meal these Juicy Grilled Honey Mustard Glazed Pork Chops can be put in the marinade for only 30 minutes to get maximum flavor. This recipe is easily doubled for larger parties to entertain. Serve it with a simple green salad or a chilled pasta salad. Pin this to your Easy Appetizer Board on Pinterest! 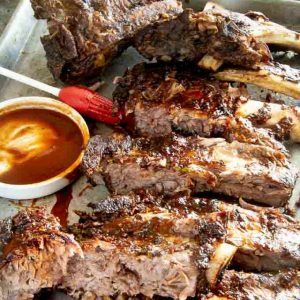 Sign up for the mailing list here where it says “join the west via midwest community” for more recipes for entertaining with out any stress! Place all ingredients except for the pork chops in a plastic bag. Seal and mix well. Then open bag, and place pork chops in the bag, seal while removing any additional air in the bag. Place in the fridge for a minimum of 30 minutes up to overnight. If you place the pork chops in the fridge longer than 30 minutes you will need to remove them 30 minutes before you wish to grill them to allow them to come to room temperature. You had me at honey mustard! This sounds so yummy! This dinner looks fantastic. I’m always looking for new ways to enjoy pork! Wow your pork chops are so thick and look so juicy, that’s making me so hungry to look at your pictures at noon! I have taken to eat only my homemade pork chops as you’re so right about them often being too dry. The marinade looks scrumptious, I’ve duly noted all your tips and am looking forward to try your delicious recipe next Sunday! You know, I saw this recipe and I was like, “Hmm I never order pork when we go out,” and I realized it’s because, you’re right, most of the time they’re dry!! Getting it right makes SUCH a difference! Having a juicy delicious chop is something I haven’t had in a long time- I can’t wait to try this!! This is the second pork chop recipe I’ve seen today and I think it’s a sign! 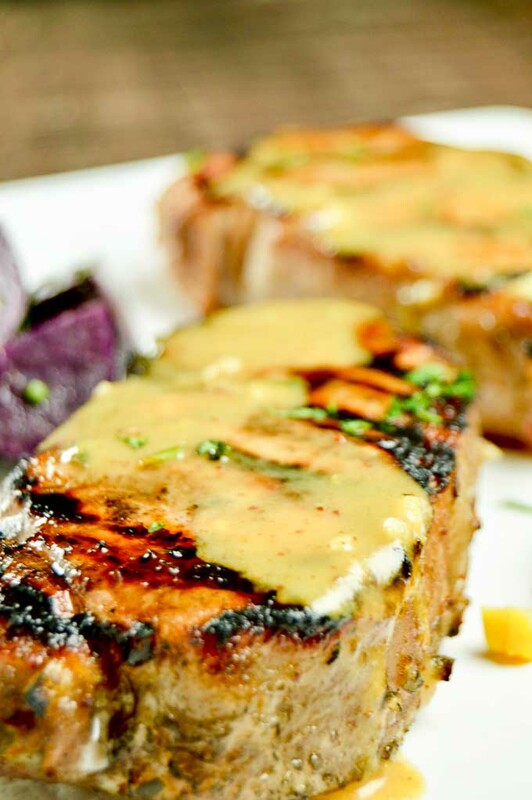 I love a juicy grilled pork chop and these honey mustard ones are calling my name. I love these flavours together. Yum! We made these over the weekend and they were divine! The brined pork chops were juicy and tender, and the honey mustard glaze was the perfect accompaniment. My guests devoured them. We’ll be making these again very soon, thanks for the recipe! I agree that properly cooked pork is a revelation! Any time I skip the brining or don’t keep an eye on the temp, it’s very sad. 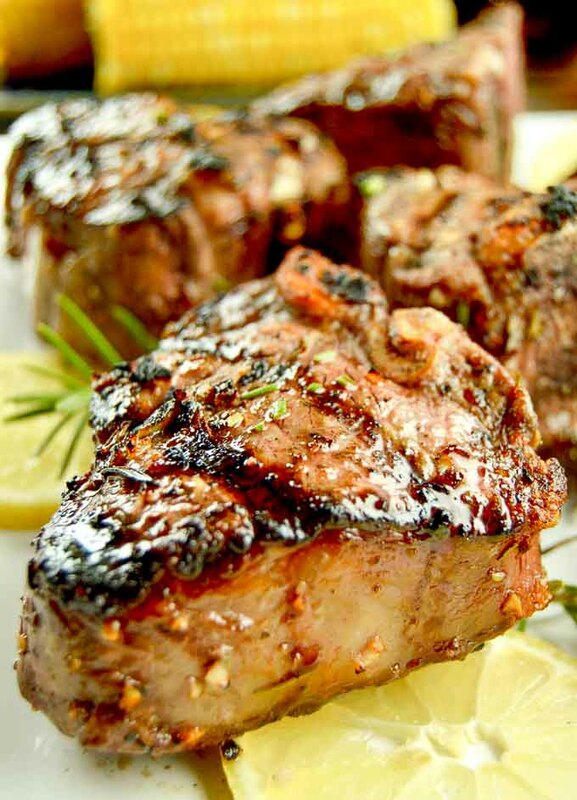 Your chops are not at all sad – they look so juicy and flavorful. And I love the honey mustard glaze. I’ll have to try these with a nice, cold bottle of Prosecco. I am definitely going to try this. I have had great success brining brisket before grilling so I am totally on board with this method. That glaze looks amazing, can’t wait to try this! We are such pork lovers. Well, a lot of it has to do with grilling them. Pork tastes great grilled especially if they are brined and then grilled with a light coating of glaze once they’re done. We haven’t tried your glaze — but next time we fire up the grill for pork chops we’ll give it a go. Wow these do look juicy!! And so thick! I’m so excited for grilling season- it’s the best time of year for sure. 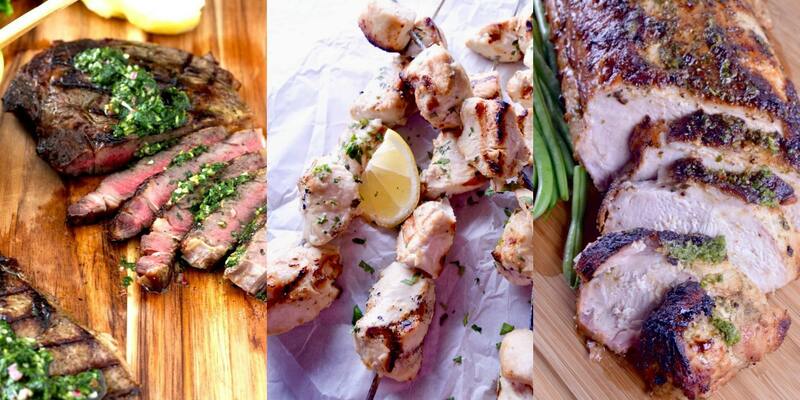 And these tips are awesome- grilling can be tricky! You are so right. So many places serve dried up rubbery slabs of pork. I rarely ever made pork chops because thats how I just thought they were. Until I tried these chops. Oh my gosh. It completely opened my eyes to a whole new world. And that glaze? I could basically eat it by the spoon. I completely agree with you on brining chops… It takes them out of the “dry, chewy, tasteless” danger zone and gives you perfectly juicy chops every time. Of course, it doesn’t hurt to crown them with that gorgeous honey glaze. This sounds like an easy, delicious dinner and I think it would be great for summer entertaining! I’m bookmarking this one! Thank you! I am thrilled that grilling season is here. That means HUBBY is in charge of dinner a few times a week….and for ALL the BBQ parties. These sound delicious. Honey, mustard and PORK…how can you not want to try this recipe. On the menu for this weekend!! Very thorough grilling tips! I love the tip for brining. I keep saying I want to brine meat but have yet to do it. I love a honey Dijon style sauce with pork. Great recipe! Love the flavours ! Thank you so much ! Wow those pork chops look absolutely delicious!! Mustard and pork go so well together and honey mustard even better! I must try this recipe soon!! Up until my early twenties my exposure to pork was almost entirely confined to my Nan’s cooking who – although she was a great home cook in some respects – cooked everything over well done. I’m talking mushy vegetables, and tough and chewy (and flavourless) pork, the whole lot. So for me, pork was always my least favourite meat because it didn’t taste of anything and felt like I was chowing down on an old leather shoe. Of course I’ve experienced pork cooked the right way since then – and cook it myself too, I’m addicted to pork belly – and although pork still isn’t my favourite meat, I’m much more happy to eat it now. 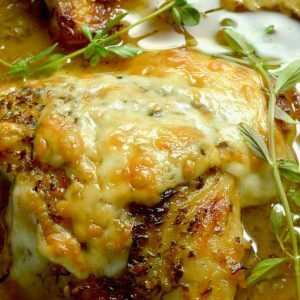 And definitely going to try this honey mustard glaze too – flavour combo awesomeness right here! And I will also finish up this essay-length comment and let you get back to your day! This looks so good, I can’t believe I’ve never tried honey mustard on pork! These chops look so juicy and delicious! I love this honey mustard glaze! I’m obsessed with honey mustard!! Its such a nice flavor boost to anything isn’t it?